Our staff and full time salesman are here to help you with any questions you may have about wheel loader or loader rental or any of our other pieces of rental equipment. Please contact us at 978-762-RENT (7368). 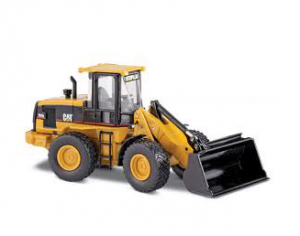 We look forward to serving all of your wheel loader and loader rental needs in Massachusetts. A wheel loader, also referred to as a loader, is a type of tractor that has a front-mounted wide bucket connected to the end of two arms to scoop up loose material from the ground. Some common uses of a loader are moving stockpiled material such as dirt, sand, gravel or top soil from ground level into a dump truck or into an open trench. They are also frequently used for snow plowing. If you are a contractor in need of a wheel loader or loader rental for your next Massachusetts construction or snow removal project then MasterRents is the rental company you want to choose. MasterRents wants our customers to rent the best equipment available which is why we provide high performance CAT loaders that maximize up time and have a low operation cost. MasterRents has the best selection of wheel loaders on the North Shore. We carry 2.5 yard, 3.0 yard, 3.5 yard, 4.0 yard and 5.0 yard wheel loaders. Along with our wheel loaders MasterRents has over 100 pieces of equipment offering reasonable rates for renting and delivery. We are located just 20 minutes north of Boston in Danvers, Massachusetts. MasterRents is also part of the Cat Rental Alliance Program which opens the door to a wide variety of equipment.